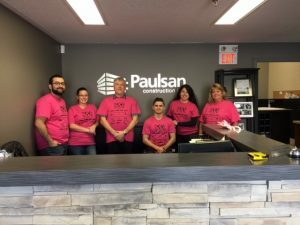 In The Community – Paulsan Construction Inc.
Paulsan is dedicated to enhancing our environment, and aspires to have a positive impact wherever we conduct our business. Design. Build. Care. ‘Care’ is especially important to Paulsan and our team. 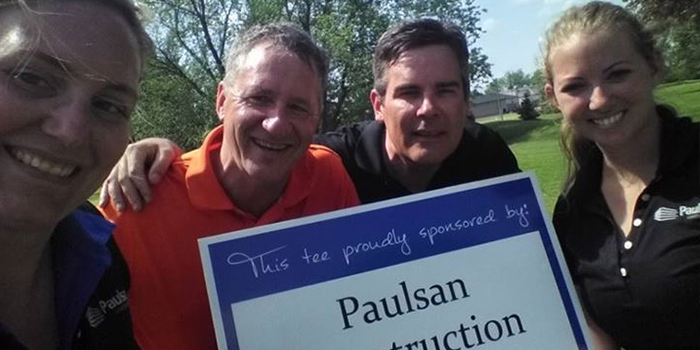 Paulsan is committed to building relationships and giving back to the communities we serve. 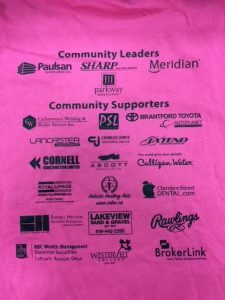 We are proud members and supporters of many community organizations and events. 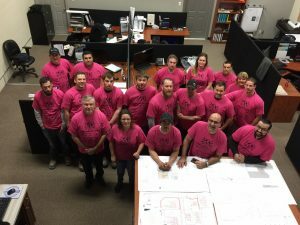 Proud key sponsor of our local Boys & Girls Club of Brantford Pink Shirt Day 2018 – a day when people wear a pink shirt to symbolize a stand against bullying. 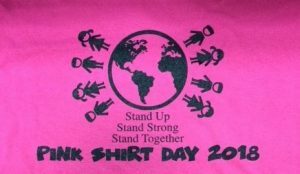 Paulsan joined our communities commitment to supporting amazing local anti-bullying programs that teach empathy, compassion & kindness. 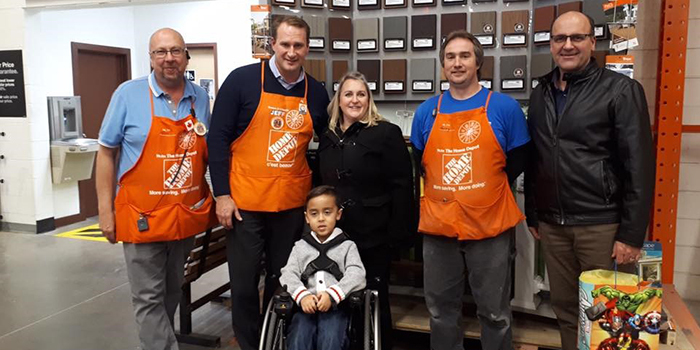 Proud to make a difference to Ronan and his family by making their home life easier and more accessible. Special thanks to Harry for leading this initiative. Harry was nominated by the staff at Home Depot for a special Executive Award and was selected! 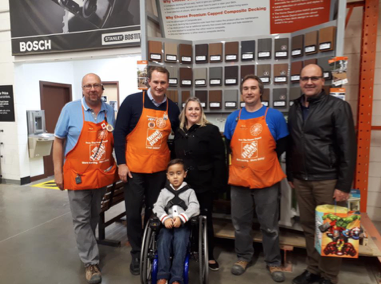 The President of Home Depot Canada, Jeff Kinnaird presented the award to Harry to recognize his good deeds and for being such a great client. Congratulations Harry!! 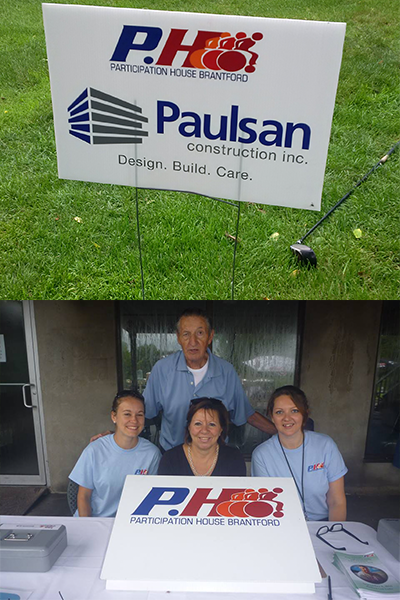 Paulsan is proud supporter of Rotary Club events in Brantford and Ancaster. 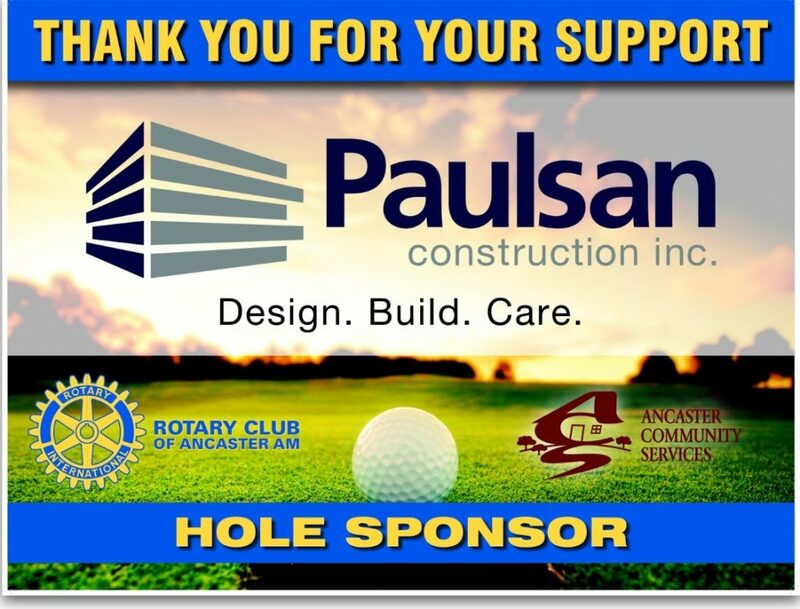 Sandro D’Ambrosi, Partner, Paulsan Construction Inc is Executive Member of Rotary Club of Ancaster. 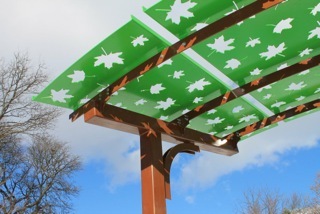 In addition to sponsoring events, Paulsan is proud to sponsor the Custom Pergola Project for Ancaster Village Spray Park. 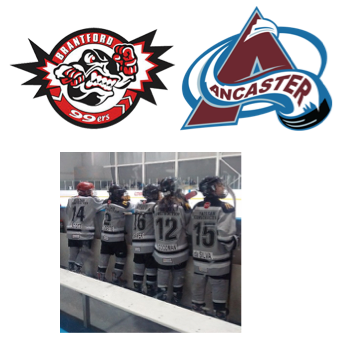 Proud sponsor of Brantford and Ancaster Minor Hockey Teams. Paul McCaig, President of Paulsan Construction, is Past President of Board of Directors of Brantford Minor Hockey League. 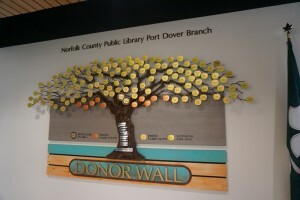 Proud sponsor of Donor Wall for New Port Dover Branch location. 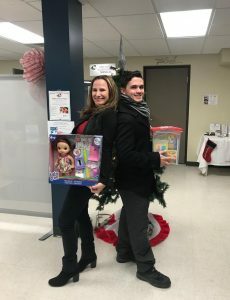 With the generous support of our employees, clients, suppliers and trade partners, Paulsan Construction provides donations to Brantford Food Bank in an annual food drive. Paulsan Construction is proud to have built and donated the Skate Tree found at the Wayne Gretzky Centre in Brantford. 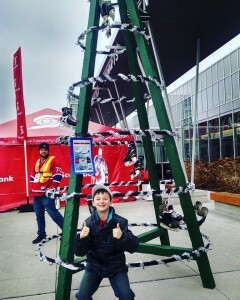 This Skate Tree was built in time for Rogers Hometown Hockey weekend, and will remain outside the Wayne Gretzky Centre to collect used skates that will be donated in the community. 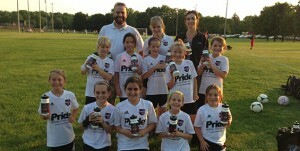 Proud sponsor of Brantford and Ancaster Minor Soccer Teams. 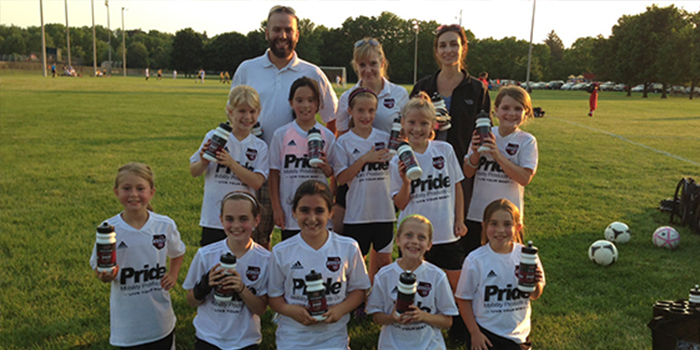 In addition to sponsorship funds for the team, Paulsan contributes with new, fun items for the kids like customized hats and water bottles! 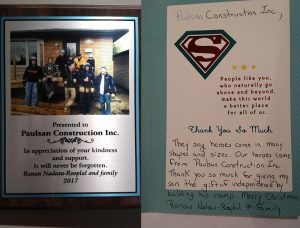 Paulsan Construction Inc. in partnership with MMMC Architects donated the materials to create decorative columns for their new canopy entrance at the Brantford location.